One of the most commonly asked questions when churches are looking to buy new church pews is how long they can expect the church pews to last. The answer depends on how often the pews are used, how rough your congregation is on them, and how much maintenance you do to maintain them. In general, you can expect church pews to last a lifetime with the existing padding and fabrics but the woods can last much much longer with proper care. Why do church pews last so long? 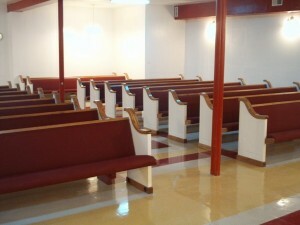 Our church pews last because of the high quality materials we use to make them. All of the exposed wood is made of solid oak, which is an extremely durable hardwood that’s been used for centuries in furniture. You can expect the solid oak portions of your church pews to last well into the future of your church once they’re installed, just like solid oak pews from the Middle Ages are often still in usable condition today. Caring for your church pews will help it last longer too, so ensure you repair any damage done to the pews over the course of their life. The seat of the pews is made of high quality plywood, the same quality and thickness used in high-end subfloors for homes. Subfloors constructed with the same plywood last well over 30 years in conditions much more strenuous than church services so you can expect your church pew seats to last well past that mark. In ideal conditions, subflooring can last forever and really only ever has to be replaced because of water damage, which it’s unlikely your church pews will be exposed to regularly. The parts of the church pews that will wear out the fastest, however, are the foam padding portions and the fabrics. Olefin is highly durable and lasts for a long time. We’ve see pews go well past the 50 year mark before they were restored with new fabrics. Pew padding has come a long way since then, too, and advancements in padding allow continuous use for decades in even the most active church communities. All in all, you can expect around 50 years of use before you need to have them restored with new padding and fabrics, depending on how often you have services and the amount of use your church pews are under. And even at that point, you only need to do restoration, which is a much less costly endeavor than replacing your pews entirely. Buying solid wood church pews is an investment in your church’s future you won’t regret. In comparison to other church seating arrangements, like chairs, church pews far exceed the competition.